Cities always seek to expand and diversify their tax bases. 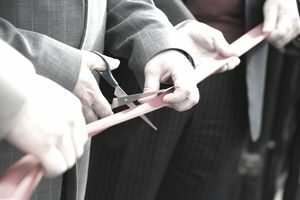 A new business opening or an existing business expanding are beneficial to the local economy. These events bring additional tax revenue and provide citizens with new employment opportunities. When a city has only one major employer in town, and that employer’s industry is struggling, that has major implications for the city government. To avoid such a situation, economic development directors work to strengthen their local economy and diversify their cities’ tax bases. They recruit new businesses, retain existing ones, and assist businesses when they can expand operations locally. Economic development directors are hired through the normal government hiring process. Depending on a city’s size, the economic development director may report to the city manager or an assistant city manager. Other city directors and local business leaders may serve on an interview panel when the city fills a vacancy. Cities generally require economic development directors to hold a bachelor’s degree in economic development, urban planning, marketing, business administration or public administration. Economic development experience is also required. An individual cannot realistically expect to hold a director level position without significant experience in that directorship’s field. Supervisory experience is likely required if the position supervises staff, but even if the position does not, supervisory experience is helpful when relating to business owners and upper-level managers. Private sector experience is also useful Because so much of the job revolves around building relationships with business leaders, being able to swap stories about past business experiences can go a long way in developing those relationships. Private sector experience will also help win the trust of business leaders who have little tolerance for bureaucrats. Economic development directors have a strategic focus. They administer economic development programs for a city. While they deal with individual businesses in individual situations, they maintain a macro-level perspective on the city’s economy. Economic development directors study market trends and apply their expert judgment to opportunities and threats facing the local economy. The economic development director advises the city manager and council on emerging and existing economic development issues. The director may also present to local civic and business groups on proposed economic development agreements. To ensure that businesses are treated fairly, economic development directors write city policy governing how tax and other incentives will be awarded to businesses. These policies dictate what sort of economic impact must be reasonably expected in order for businesses to qualify for particular incentives. Economic development policies are ultimately approved by the city council. Deviations from policy are also brought to the city council for approval. Cities are proud of their mom-and-pop businesses, but when it comes to economic development, cities mostly concern themselves with established corporations who can provide substantial job opportunities to existing and new residents. Hundreds of new jobs mean new housing construction, more retail establishments and more city revenue. Economic development directors must focus their time on businesses that provide significant economic impact. Economic development directors maintain an inventory of available properties for businesses to occupy including retail space, industrial space, and open land. They try to match businesses to available space so that business owners can picture their businesses opening in, moving to or expanding in that city. In addition to bringing in new businesses, economic development directors look to strengthen the businesses already located in the city. They persuade businesses to remain where they are and expand operations when appropriate. Losing an existing business is worse than having a new business choose to locate elsewhere. Missing out on a new business means no economic impact. Losing an existing business means adverse economic impact. Like other city director positions, the salary for an economic development director depends on the size of the city and the size of the economic development department staff. The bigger the city, the larger the economic development director’s salary. Similarly, the more people a director has under his or her line of supervision, the higher that director’s salary tends to be.